For the best quality, most professional commercial pressure washing Columbia SC, you need the best — Clean Finish Pressure Washing. With more than 10 years in the business, Clean Finish has the experience and expertise you need to get your commercial building or business clean, sparkling, and looking brand new once again! Our services are perfect for a wide range of commercial businesses, including hotels, HOAs, condominiums, office buildings, parking garages, vehicle fleets, oil stains, sidewalks and walkways, drive-thru lanes, and storefronts for small, medium, and large businesses. We have a vast amount of experience cleaning all of the above mentioned buildings and surfaces, and there is nothing we cannot clean! We are a fully licensed and insured company, giving us an edge over our competition and giving you some peace of mind knowing that you are working with a completely professional, dedicated, and accountable company instead of some inexperienced hack. There are a number of benefits that come with getting your commercial property professionally pressure cleaned. First, your business’ building is the physical representation of your company to all potential customers, and, in this instance, first impressions really count, so presenting your business with a sparkling, clean, and fresh image can have a dramatic impact on the first impressions clients have of your business and can make them even more likely to come into your business to buy your products or services. Secondly, without a regular cleaning, your business’ building can suffer dramatically from wear and tear, costing you lots of money in unnecessary and frequent repair costs. Cleaning your business’ exterior can alleviate this problem and save you a ton of money in the process. Finally, one more benefit is that, when your building is sparkling and looking well-kept, your customers will know that you put a great amount of care and effort into maintaining your business, and they will consequently have faith in the amount of care and effort you put into your products and services, too. 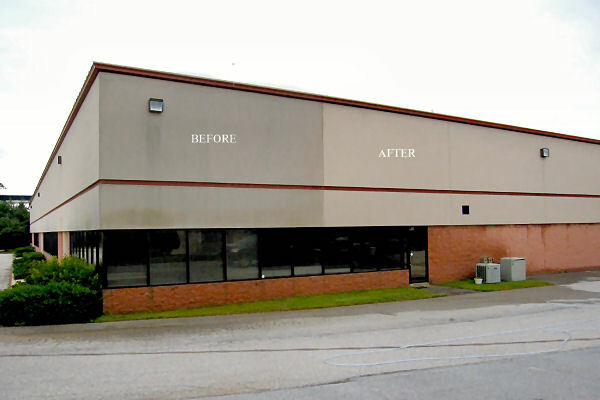 With our professional, affordable, and dependable commercial power washing services, we do so much more than just clean buildings and concrete — we create lasting impressions that your customers will remember for years to come. We give you the opportunity to show your customers just how much you care about the appearance and image of your business. We promise that both you and your customers will be wowed and amazed after we are done cleaning your building! To get a free, no obligation quote on commercial pressure washing Columbia, give us a call today at 803-229-2732 or send us an email at west@clean-finish.com.